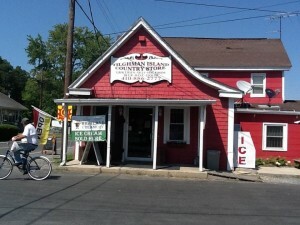 Since June 1 when I began renting my little writing cottage office and as a result of the fact that I don’t in any way cook (ever), I have literally been nurtured at the Tilghman Island Country Store (“TICS” if you’re an islander). I consider the owners (let’s call them Patricia and John, because those are actually their names and I am too lazy to make fake names up for them and I’m not going to say anything bad about them anyway) good friends because they are truly just amazing people. To first of all save a tiny country store from certain doom and closure, and then to enhance it with awesome things like wine and steamed shrimp and homemade baked goods that knock the island’s socks off? They are just the best. I don’t drink wine (sulfites/migraines), but I go to all the TICS Friday night wine tastings because the food is yummy and I can buy a ghetto-sized Jack Daniels for $13 and a bottle of Cherry Coke or Ginger Ale to mix in a styrofoam cup from the coffee section. I’m classy like that. I love an old fashioned country store, and Patricia and John have done a fab job of keeping the flavor of the historic store while adding the modern conveniences (amazing deli meats, local wines and Hello, Red Velvet Cheesecake, Is It Me You’re Looking For?!). The only thing I have to ‘import’ from the other side of the drawbridge to Tilghman Island on weekends is Evian (because I am a bottled water snob, and yes I know it’s NAIVE spelled backwards and I’m stupid for paying so much but I swear to God I can taste the difference in any other water). So other than water, I buy everything from TICS. I love supporting a local business, and such an amazing one at that. P.S. 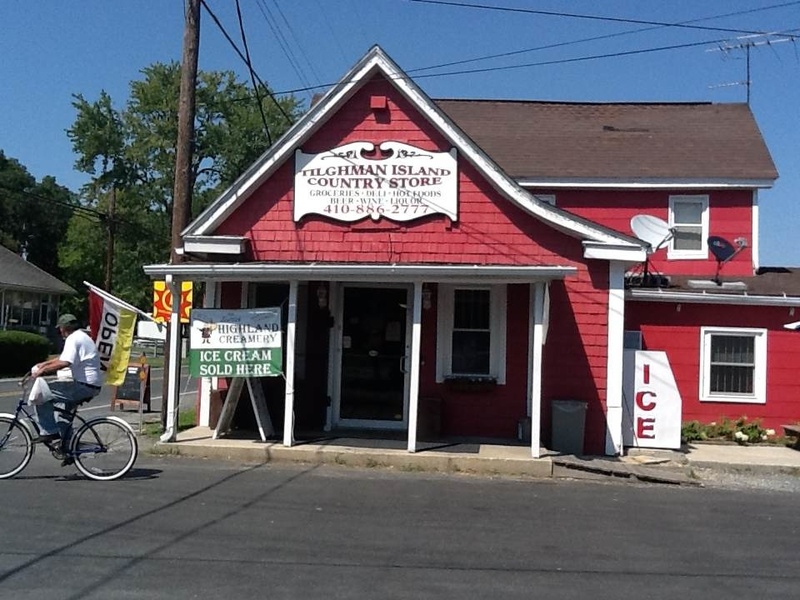 You should totally go “like” the Tilghman Island Country Store on Facebook so that if you don’t happen to be anywhere near the remote Maryland island, you can enjoy their awesomeness virtually. Mary, we're taking the kids to Tilghman Island in two weeks to go out on a schooner boat for the afternoon. I will definitely stop at TICS to get some ice cream now…do you have to know a secret password or anything to venture onto the backporch to purchase the Oxford ice cream? Or, is telling them I know you password enough! TICS is absolutely the best! We are down to our home in Tilghman every weekend and the kids enjoy riding their bikes to the store, chatting with the owners, buying some candy with their own money and coming home and eating it in one sitting. I love to go and buy wine each friday night, whatever is on special on saturday and the desserts–to die for. Patricia is great…we stopped by there one Saturday and my poor three-year old son "got sick" there at the store (it was a long, hot day!). Patricia and her mother jumped in to help me clean him up and settle him, and helped me juggle our six-month old as well (hubby had gone to get the car down the street). Never made me feel like a nuisance or that I was in the way. Made me feel like I was family! I knew that day that our decision to move to the Eastern Shore was the right one, thanks to people like them. We love going to the country store and yes we literally go EVERY weekend. I lvoe the "open door policy" on Tilghman – it is what I knew growing up in Southern Maryland and is the same here! Will keep going – love the special treats they make every weekend too!